Former Spain coach Vicente Del Bosque spoke to Esports SER Catalunya about Sergio Busquets on the 10th anniversary of his debut for Barcelona. 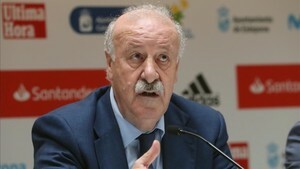 Vicente Del Bosque: "Sorprende que haya tan pocos jugadores del Barça en la selección"
Del Bosque had total confidence in the midfielder for the 2010 World Cup in South Africa, even though he was criticised for picking the youngster. Busquets became key for Spain and Barca. "Busquets is the player that best complements his team-mates," said Del Bosque. "Busquets leadership is the best possible. Without Sergio the success of the national team would have been a lot harder. Busquets was the only Barca player to start in either of the UEFA Nations League games for Spain. "It's surprising there's so few Barca players in the national team, but there are cycles. It doesn't speak badly of La Masia, there are eras, but no club should forget about youth football."